I've realized, over the past few years, that there are restaurants that make a big splash within the food community, and there are restaurants whose opening just make a major splash throughout the community at large. Everyone, food obsessed or not, hears of its opening and puts it on their list as a must go. Last fall one of these places opened- it seemed that everyone I spoke to heard of Cinque Cento as it opened it's doors, and it was on everyone's list to check out. 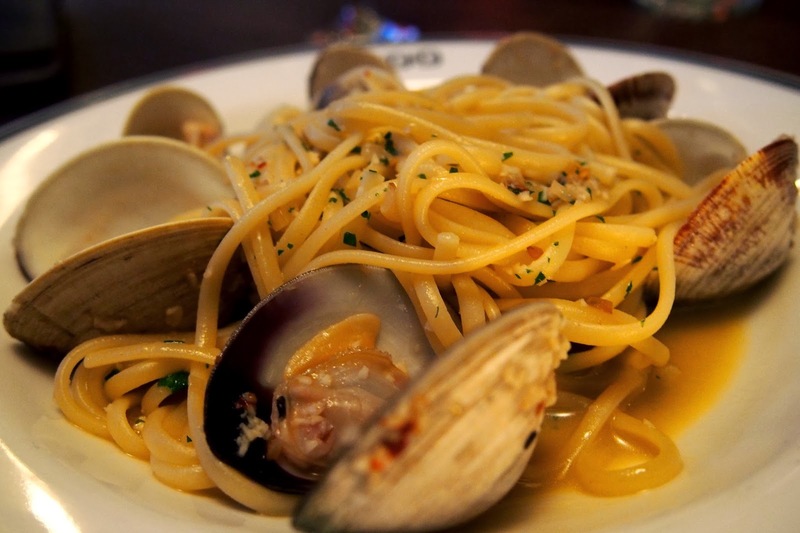 Adjacent to the famous SoWa market space, CinqueCento is a Roman Trattoria, meaning that it's food isn't your typical red sauce Italian, but instead focuses on authentic regional cuisine. This means that Cinquento concentrates on fresh vegetables, utilizing full animals for all available meat, and home made pastas. It's the type of food that is known for being rustic, it's known for being filling, it's known for being comforting. CinqueCento delivers on all counts. and topped with that wonderfully acidic Italian condiment Giardiniera which so nicely cut the decadence of the tongue. The flavors of the pickled vegetables with the rich meat was the perfect appetite wetter. 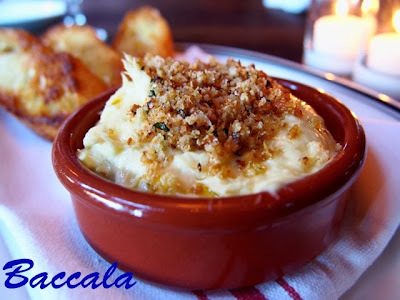 The second new antipasti we tried was the Baccala Mantacato. I feel as though Baccala, which in its basic explanation is dried salt cod that has been re-hydrated. Here, at CinqueCento, the Baccala is whipped to a beautifully spreadable consistency, topped with a bit of oregano and then served with crostini. I have met Baccala's that I didnt like, multiples to be honest, but CinqueCento's version- I had second and thirds of. The consistency was perfect, and the flavors were spot on- subtle cod, hints of salt, and the oregano made it fresh and floral. Next to our table was the Insalata di Barbaietole con Brassica. 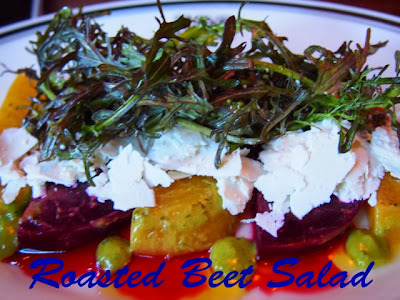 Roasted beets, Ricotta Salata, red mustard greens and an herb vinaigrette. Now, I have spoken to you all almost endlessly about my love of Ricotta Salata before- dehydrated ricotta cheese- it's salty and crumbly...it adds a little excitement to every dish its added to. Here, when mixed with the earthy beets, it created that pop in every bite. This salad was perfectly paired with the herb vinaigrette which made the entire dish feel fresh and natural. 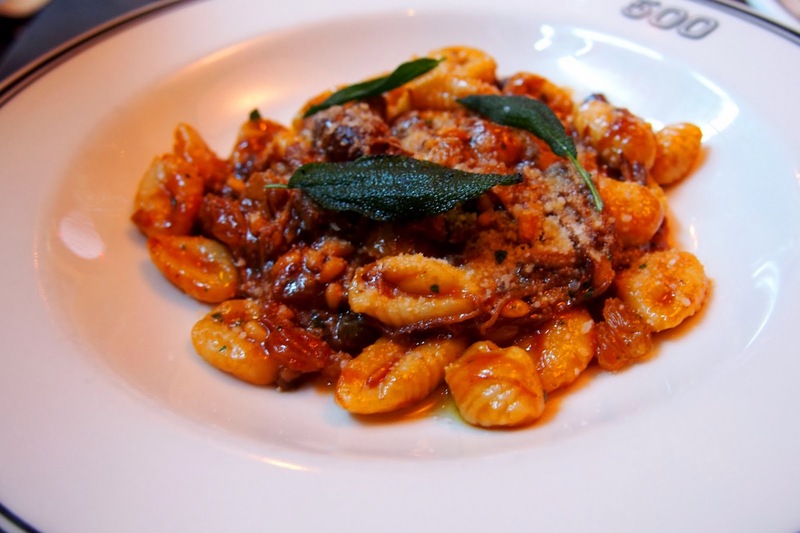 We entered into the realm of main courses next, starting with their Fusilli con Collo d'Agnello. Freshly made Fusilli, blanketed in a lamb neck ragu spotted with braised artichokes and spiced with oregano and Pecorino cheese. One bite of this dish and closing my eyes I could picture being warmed and comforted while snow swirls outside the windows. The lamb neck ragu was rich and hearty, with the lamb adding a subtle flavor enhanced with the floral beauty of the oregano. Mention must be made though of the pasta itself. Expertly made Fusilli, gentle cork screws cooked to a wonderful al dente both acquiesed to the sauce and presented it in a perfect showcase. We then dipped our forks into a reappearing old favorite to the menu- Gnocchi al Sugo di Cinghiale. Tender potato pillows, wild boar shredded into a sauce, mixed with sweet golden raisins, pine nuts, and a bit of Pecorino cheese. This mix of ingredients created the perfect contrast in flavors and textures. 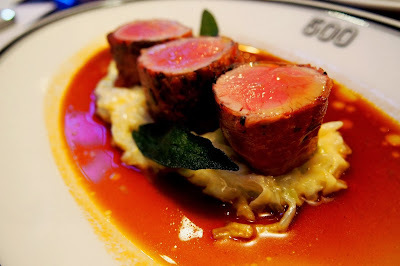 The boar was rich and decadent, the raisins added a sweet pop and the pine nuts brought in a change in texture from the soft potato pillows and also brough in a wonderful earthy feel to the meal. A shower of Pecorino over the top brought in just a little salty enhancement. Tortelli con Zucca e Salvia. Ripe with flavors of the harvest, I feel that squash ravioli have become an absolute stape on autumn menus. 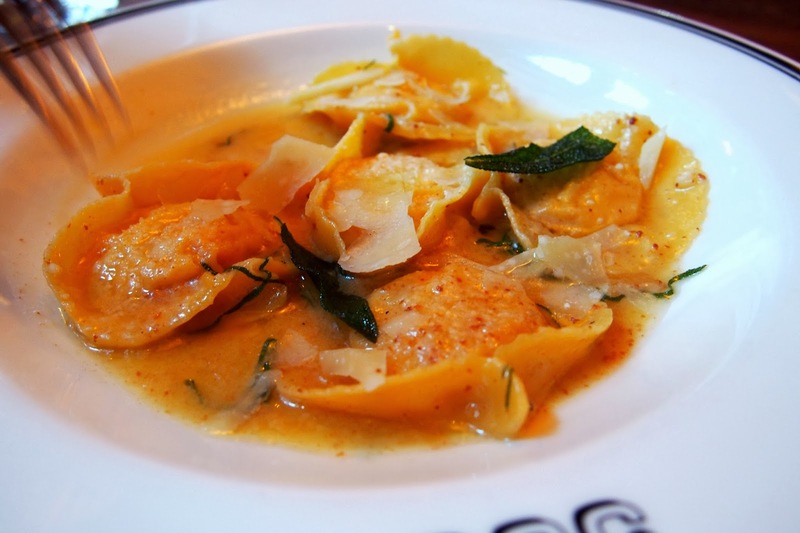 Cinquecento is creating theirs by caramelizing squash with ricotta cheese and stuffing them into fresh pasta sheets, forming delicate ravioli, and then dousing the cooked product with a delicate brown butter and sage sauce. To be frank- there is nothing wrong with this dish. Creamy sweet squash, browned butter, earthy sage...its a timeless combination of flavors that rarely fails. Very simply -order this dish. We turned our attention to the Carne side of their menu next and tried out their Maiale alla Griglia e Zucca. 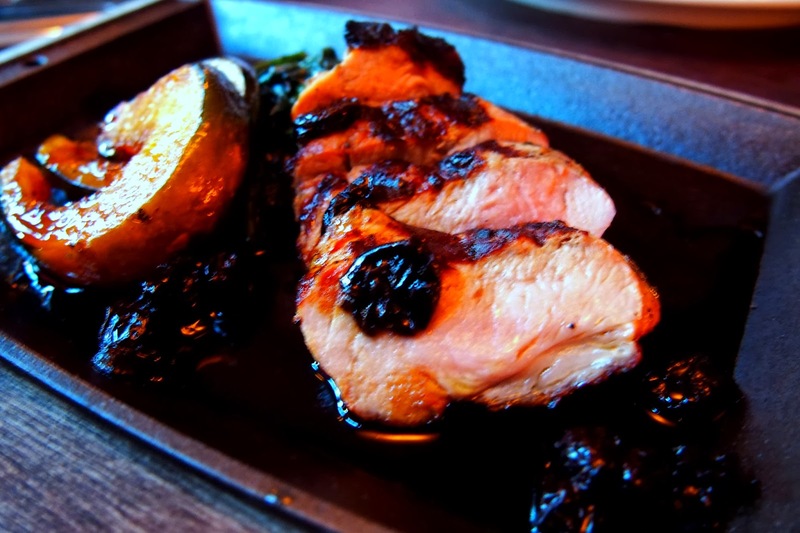 Tender and perfectly seasoned pork loin was perched atop a medley of acorn squash and braised greens, and then drizzled with a robust sauce of sour cherries. This was one of the more tender pork dishes I've had in recent history. I loved how simply the pork was prepared, with limited seasoning, which allowed for the beauty of that sour cherry sauce to shine. Every bite was true pork flavor mixed with just a little salt to make it addictive and then the sweet and sour tang of the cherry sauce. was cooked in the same expert style as the pork of the previous dish. Simple seasoning, executed well, created a perfectly flavored, tender dish. As delicious as the veal was however, the cabbage fondue, which I determined may just have been cabbage cooked incredibly slowly with butter, salt, peppper and onions was so incredibly decadent and a perfect, gentle compliment to the hearty meat. Plain and simple, Cinquecento is executing. 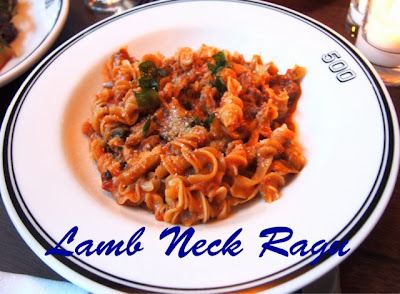 Their flavors and ingredients are true to the Roman style they invoke and every dish is cooked with intricate technique to make for simple dishes perfectly done. 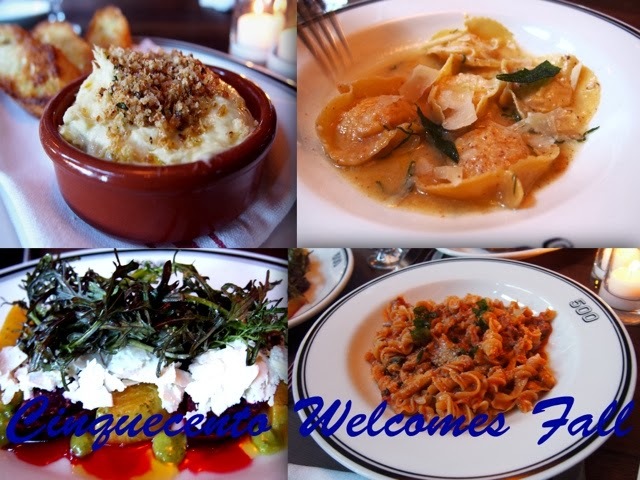 Definitely head on over, even now a year after opening, Cinquecento is still making a splash. What a great meal! I still haven't been to Cinquecento either, but i already have reservations for next week :) Can't wait! Glad you enjoyed your dinner; looks like you got a great sampling of the menu. I have been once and really enjoyed it. I loved their appetizer menu, could go just for those!